Obama treads lightly on his top leg priority in the speech -- just one paragraph for immigration reform. This speech shows how little you can really do with executive orders. Big things require legislation. RT @jeffzeleny : Should I clap or not? Cantor seemed unsure if he should on the call to pass immigration reform but he finally decided...Yes! As Obama says "it's time" for #immigration reform, be sure to read today's LAT @ByBrianBennett on GOP's plan being unveiled this week. 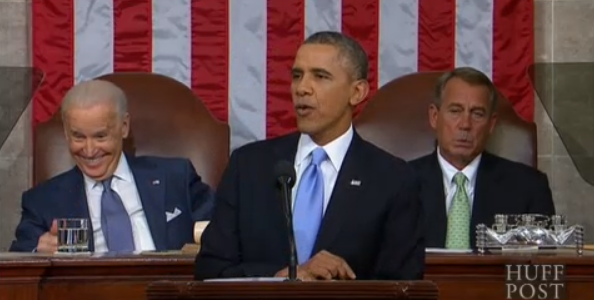 Boehner notably not applauding at Obama call for extended unemployment insurance. Obama on immigration: Rs and Ds "in the Senate have acted. I know that members of both parties in the House want to do the same." @emily_booker : Yup. "@BuzzFeedPol : Obama earns a thumbs up from Boehner. #SOTU "
Lets strengthen relationships with China. Too difficult to obtain Visa. Obama: ..."let's get immigration reform done this year." Obama repeats "all of the above" energy call that enviros dislike, couples it with call to protect key areas from drilling. In SOTU 40 years ago this week, Nixon touted "Project Independence"--to achieve US energy independence by 1980. Obama alternating aggressive-aggressive and passive-aggressive: "And as Congress decides what it’s going to do..."
Federal pre-k program. Oh joy! #sotu They've done a great job with k-12. Stop blaming everything on congress not agreeing with you. This is not a dictatorship. After last year's call for preK, Dems didn't finish writing a bill until November. Time to do away with workplace policies that belong in a Mad Men episode. #SOTU That may just have been the tag line of the speech. Obama: "It's time to get rid of workplace policies that belong in a 'Mad Men' episode...I believe when women succeed, America succeeds." Lots of Rs stand up to clap for Obama line: "a woman deserves equal pay for equal work"
Was that the first mention of Mad Men in #sotu ? Notably missing from #SOTU -- no call for high-earner income tax hike. Obama now willing to settle for what he got in fiscal cliff deal. Women members (and Joe Biden) standing at Obama call for equal wages and doing away with "Mad Men"-era work policies. Speaker, not. I fully endorse Punch Pizza's pizza.